‘The Electrified Automotive Future and its Relationship to Architecture’ was the subject of an evening hosted by Barr Gazetas and Jaguar design, inviting a group of London’s leading architects, planners, property developers and infrastructure experts to participate in a discussion on the future of electronic car infrastructure. Three concept designs, created in collaboration with Ian Callum, were presented to guests, showing Barr Gazetas’ vision for the ‘charging plazas of the future’. Jon Eaglesham, managing director of Barr Gazetas, said: ‘This study is all about realising opportunity. We don’t believe any of our concepts are particularly “far-fetched” and all should be wholly possible within a generation: as designers of the built environment, a successful future for electric vehicles impacts every aspect of our work. Ian Callum, honorary RIBA Fellow and the brains behind Jaguar’s first all-electric SUV, the I-PACE, called for urgent action to address the critical need for well-designed and planned infrastructure to accommodate the fast-approaching tipping point in the electrification of automotive and transportation. BuckleyGrayYeoman has completed the refurbishment of a workplace-led campus in Bristol, in the former Fry’s chocolate factory. 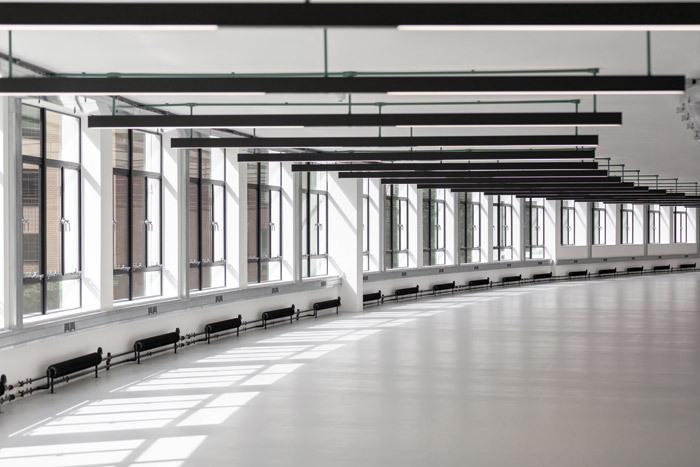 Some 16,700 sq m has been refurbished for the campus for Bristol’s burgeoning creative and digital business community. Mixing innovation, art, business and media, the eight floors for Bristol’s Programme business provide refurbished office space on the upper floors, with a public art gallery, and independent restaurants and shops on the lower floors. As part of the London Design Festival and designjunction, British designer Steuart Padwick’s sculpture Head Above Water made a dramatic change to the London skyline in support of mental health. Hoare Lea collaborated with Padwick to create a lighting scheme to engage and inspire. 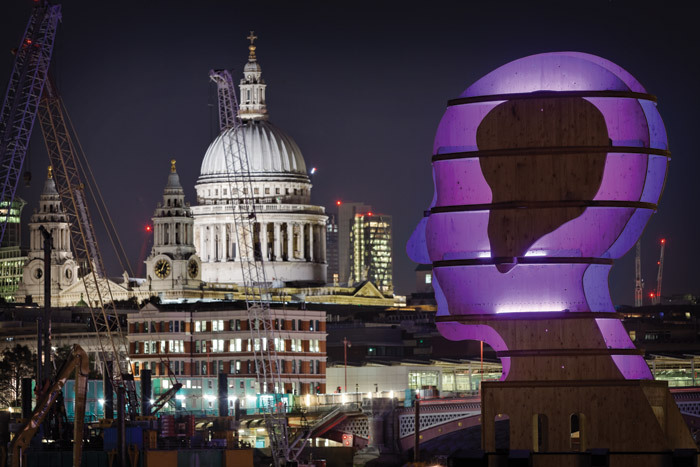 Taking the form of a giant wooden head elevated above the Thames on Queen’s Stone jetty (aka Gabriel’s pier), the 9m-high interactive sculpture stood as a symbol of bravery, compassion, positivity and change for those who have come through or are confronting mental health issues. At night, Head Above Water was lit and people engaged with its changing colours to reflect how they were feeling through a designated Twitter feed – in real time. Hoare Lea’s lighting design specialists were the masterminds behind the lighting scheme. Head Above Water was able to interact with users via social media, acting as a barometer for London’s wellbeing. The technology and scripting behind the sculpture was also developed by Hoare Lea to anonymously log the interactions. These will be collated to show the emotional state of the audience over the course of the installation. 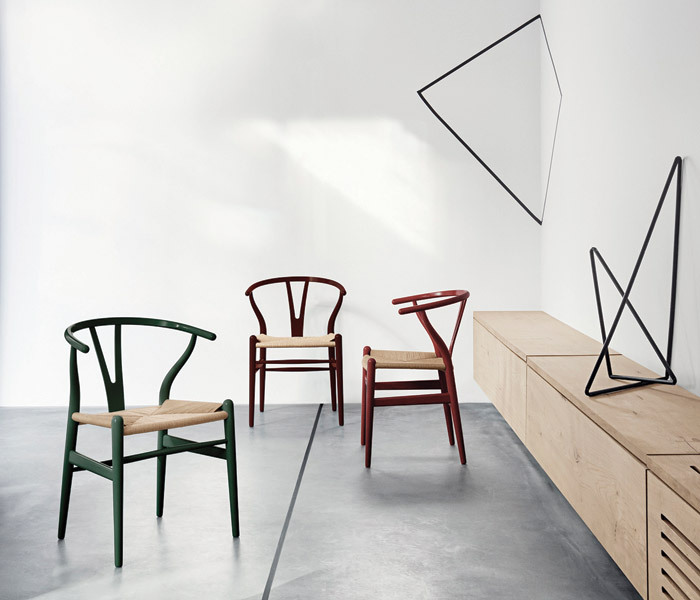 Furniture manufacturer Carl Hansen & Co is presenting Hans J Wegner’s iconic Wishbone Chair in six new anniversary colours, with limited availability in celebration of its 110-year anniversary in October. Designer Hans J Wegner had an experimental approach, not only when it came to forms and materials, but also when exploring colours. So Carl Hansen & Son has highlighted the chair’s numerous possibilities for variation and visual style by introducing this Fifties’ design in six new colours inspired by nature. Earth tones Rosy Blush, Russet Red and Deep Burgundy are contrasted with Oyster Grey, Forest Green, and Deep Olive; with a handwoven seat in natural paper cord.